In baseball, it's steroids. In football, helmet-to-helmet hits. Flopping in basketball and soccer have reached epidemic-levels. But another cheating scourge has hit a major world sport. The Federation of International Polo has released a report indicating that the Chilean National Team has been corking their horses for the better part of the past decade. This creates a lighter, faster horse more capable of flashing around the polo pitch at lightning speed. 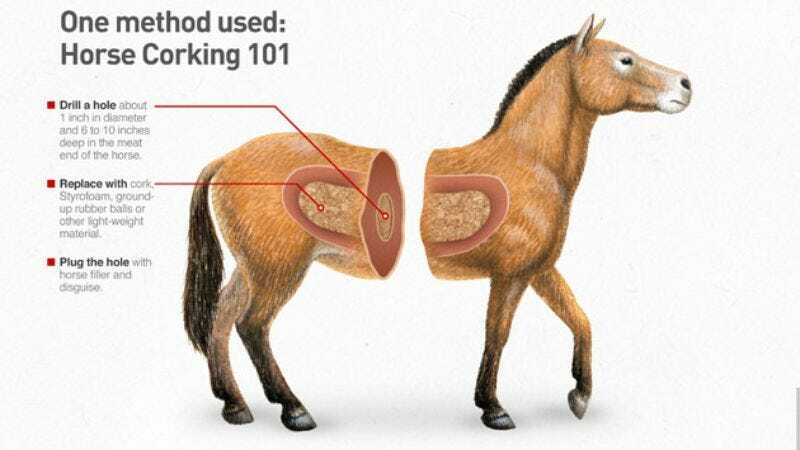 At times many competitors would cut open their horses and stuff them with silicon or some similarly malleable substance that allows the horses preternatural flexibility, giving them the capacity to squeeze into tight spots and even bounce back up quickly after taking an otherwise devastating fall. This has earned Chile's most famous polo horse the nickname Caballo De Goma or "Rubber Horse". Here's what you need to know about Horse Corking. Click image to enlarge.